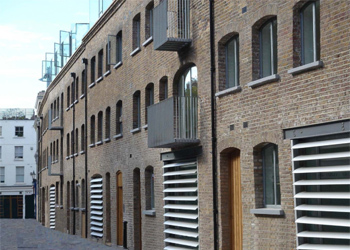 The property forms part of a complex of offices and studios located on the western side of Powis Mews. Powis Mews runs between Talbot Road and Westbourne Park Road and thus lies at the heart of Notting Hill with Ledbury Road, Portobello Road and Westbourne Grove nearby. Westbourne Park Underground (Circle, Hamm &City Lines) is within easy walking distance and Notting Hill Gate (Central, Circle, District Lines) is also within reach. View property map. The property is a modern ground floor studio office comprising a single open plan area with kitchen having an approximate net internal floor area of 336 sq ft (31.2 sq m). A new lease is available, to be excluded from the Landlord & Tenant Act 1954, for a term of up to five years, which may include a mutual break option on three months notice at any time after the first year. £19,500 per annum exclusive of VAT and other outgoings. Rent payable quarterly in advance. A deposit will be required equivalent to one quarter’s rent (plus VAT). The rent will be subject to VAT in addition. The local authority has verbally informed us that the rateable value for the premises is £16,000 and the rates payable for the current year ending 31/03/18 are £6,090. Qualified occupiers will receive small business rates relief. Interested parties should make their own enquiries and confirm: - Royal Borough of Kensington and Chelsea business rates department 020 8315 2082. An E.P.C has been prepared and is available on request: Energy Performance Asset Rating 107 (Band E).